Founding Internet stores is topical not only for stores which are market oriented in the Internet. Developing an Internet store is topical also for B2B services thereby there is no need to send the topical price lists and stocks to the emails of clients. The work of managers decreases and productivity improves. 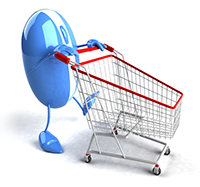 A good Internet store is like a good working instrument – it is easy to use, good working, expensive but worthwhile. We offer to develop an Internet store that will be appropriate for the needs and demands of your company. An easy management system of Internet store will let you control the operations of store and product order processing quickly and effectively. Qualitative optimization of search engines will increase the attendance of internet store and the number of sales. The costs of the development of internet stores are quoted individually for every project by depending on the preferences of the client. The costs of the development of Internet stores are starting from 1500 EUR + VAT. Contact us to receive the offer.